Or, should I rephrase the above and strike out electricity from the list, owing to the fact that electricity is not essential and its absence can be tolerated? Well, at least in this IT age, you shouldn't allow yourself to be deprived of these basic 'needs'. Needs because these are not merely 'wants' anymore. SESB announcement posted on its website. As far as schedule is concerned, many people will be without power supply tomorrow (June 23) beginning 10.00pm until 2.00pm the next day. That would be 16 long hours of blackout. And there goes my EURO football match between France and Spain! Affected areas include most parts of Putatan district, to part of old Papar road, to Kepayan including most parts of Penampang and Luyang, and the busy Karamunsing/Sadong Jaya in Kota Kinabalu. But why 16 hours, and why the power cut in the middle of the night? Can we not do the maintenance works during daytime when people are not confined at home? This maybe acceptable thirty years ago but not today. Not anymore. You cannot just simply cut the power off and think that it is okay. This is all about the tidak apa (it's okay) attitude some people are clinging on to. "It is okay to leave half of the city without power supply. It is okay if the services we provide is sub-standard. It's okay, people will soon forget about it." And the list goes on. Being the monopoly in the business, SESB should shoulder the social obligation to supply power with minimum interruption. Sixteen continuous hours is just unacceptable. If the intended tasks permit it, break the job into several shorter hours. If it is not possible to be carried out in stages, then SESB must put a provision to deploy mobile generator sets to the affected areas. Quite surely, substations are equipped with the necessary switchgear to take-in power from sources other than transmission/distribution main. This exercise is not cheap, and it may not be required or stated in the supply contract but you are morally and ethically obligated to do it. I will be directly affected by this lengthy power supply shutdown and I am very disappointed by the way the utility company schedule its maintenance works. HAVE A BLAST EVERYONE, AND ENJOY YOUR LONG EARTH HOURS TOMORROW! Yes agreed. I believe the main reason SESB go for weekend is to avoid the weekdays. Majority company are not working over the weekend. 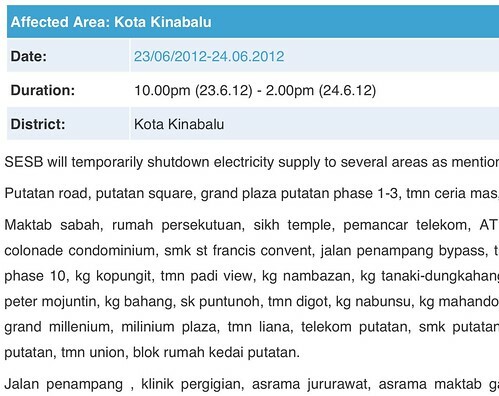 And since KK has less industrial factory, this would also make them more to choose weekend. Simple story, avoid being lawsuits for losses any company had to bear during this process. We need to come forward and make them known that this is wrong and create unnecessary to others. Being the sole power handler doesn't meant that we could tolerate any wrongdoing. ,something that Sabahan have to bear by stopping the Lahat Datu Coal fired project. @tehr - terlepas tengok Spain vs France. Tapi takpa, Spain menang jugak akhirnya! @syamzazali, thomas - when there is only one entity in a particular business, there is tendency 'to go easy' on meeting key result areas. Hope this is not the case for SESB.